The assessment evaluated 161 active volcanoes in the US, placing them into five threat categories. "The threat assessment places volcanoes into five threat categories: very low, low, moderate, high, and very high. Within all five threat categories there are changes in relative rankings of volcanoes, and in a few cases, volcanoes moved between categories owing to changes in our understanding of their hazard, unrest, and exposure factors," according to the study abstract. Over half of the highest threat category volcanoes were found to be in the states of Washington, Oregon and California, where "explosive and often snow- and ice-covered edifices can project hazards long distances to densely populated and highly-developed areas," according to the study. Five of the "very high" threat volcanoes are in Alaska, close by population centers, economic infrastructure and busy air traffic corridors, while two "very high" threat volcanoes are on an isolated volcanic archipelago in the Central Pacific. According to the report, the high- and moderate-threat categories are mostly Alaskan volcanoes. Mysterious White Cloud Hanging Over Long Dead Martian Volcano. What is It? "In these categories the generally more active and more explosive volcanoes in Alaska can have a substantial effect on national and international aviation, and large eruptions from any of the moderate- to very-high-threat volcanoes could cause regional or national-scale disasters," the study states. However, the assessment did not identify which volcanoes are most likely to erupt soonest. 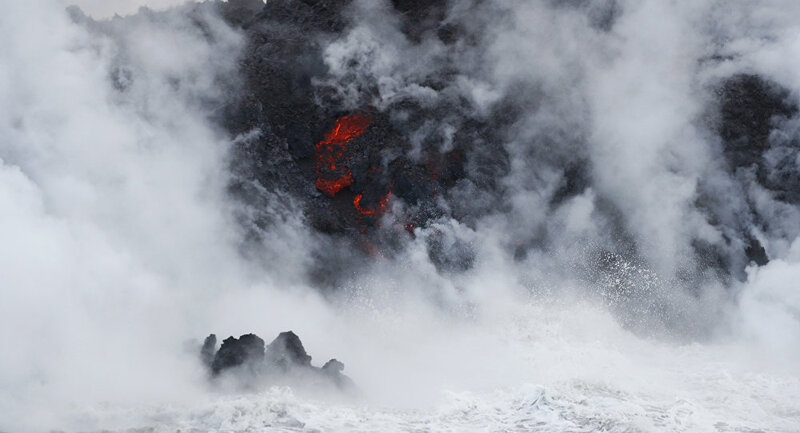 Earlier this year, the Kilauea volcano in Hawaii erupted, prompting the evacuation of around 10,000 people. On May 11, US President Donald Trump decreed federal funding for Hawaii, providing both state and local authorities with federal assistance in recovery efforts in areas affected by the ongoing eruption.